I don't know how much longer I can do this. It's getting to where I don't want to do it anymore. I just feel so awful all the time. I felt bad with Valerie, but not like this. This is worse. My back aches. My hips ache. My feet hurt and swell. The heartburn / reflux is terrible. Just in general I don't feel well at all. I'm not sure if my blood pressure being up is causing it, but lately I have waves of feeling like I'm going to pass out. Standing on my feet for any length of time makes me feel weak and light headed. Some of it is related to nerves / stress / anxiety. I often have that panicky feeling and find myself almost hyperventilating. Mini anxiety attack, maybe? I try to rest as much as I can and lay down when I can. I know, I need to just relax. Easier said than done though when it seems there is always so much to do. I'm just ready. 33 weeks is still too early and I definitely am not wishing for a premie. I just hope the next few weeks fly by... You can come in 3-4 weeks Veronica!!!!!!! Valerie was up ALL NIGHT LONG!!! I told her we were going to a birthday party today. I don't know if she was excited about that or what. She didn't go to sleep until 10pm. She woke up at midnight and did not go back to sleep until 4am!!!!! This is not a good day. Well, things have quieted down some. I'm still not sure how much Clint "gets". I just don't need to be stressing about anything extra right now. It's hard enough with him so busy and having so little free time. This pregnancy has been physically draining, but it has also taken an emotional toll on me. Busy or not, I still need some kind of support and encouragement from him at times. I don't need the added stress about moving or worrying about him leaving. This whole ordeal has been so hard and I never feel good. I wish I could have a few good days and get a break from it all. I don't think I'll be going much of anywhere from now on. 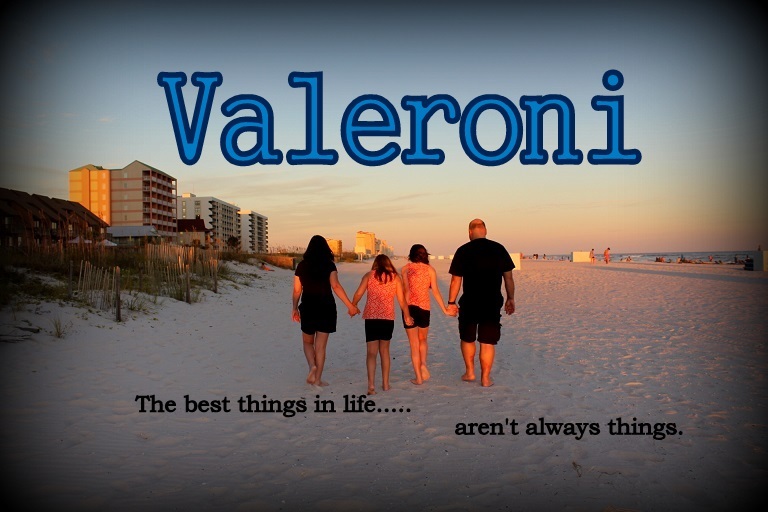 It's getting harder and harder to get out, especially with Valerie. I'm just too tired.... too short of breath... and too achey. I had an appointment yesterday. Routine stuff. My blood pressure was up (surprise, suprise.) It still was with in the normal range, but on the high end. Weight is fine.... I'm up about 20 lbs. Baby's heartbeat was right at 150. I go back in 2 weeks. I'll be so close to full term by then. Please hurry, as I don't think I can do this much longer. Valerie has a new obscession - the Barney "I Love You" song. She barely watches Barney, but she loves that song. I need to get it on video before she stops doing this. The past two nights she's fallen asleep in my arms listening to me sing it to her. If I ask her if she wants to sing the "I love you" song, she climbs up next to me and cuddles with her head on my shoulder. It's the sweetest thing!! Yesterday my parents were here, and when I asked her about singing it, she ran to my dad and said "Poppi!" and made him hold her while we sang it. Then after Val ran to my mom and said, "Meme!" and it was my mom's turn. Cutest thing ever. Apparently my husband wants to move to Houston. We've had this discussion a while back and both agreed it wasn't our best interest to even consider moving there. It just is NOT an option for me. I've told him that if he ever decided to go.... he'd be going alone. While he was there last week, he found out he was going to be recommended for two positions opening up. Yesterday he drops the bomb that we needed to talk about the jobs. He is actually considering them. As if I don't have enough to be stressed about as it is. He really thinks it's a good idea to move to Houston because a) it would guarantee he'd never be sent offshore again, and b) we could find a bigger house cheaper than ours. And there's the prospect of good schools and doctors. So what?? What we have here is fine. I told him - again - that it's his decision, and if he chooses to go that route he'll be going alone. It may sound bad, but if I have to pick between my husband and my home.... I choose home. I'm not giving up MY life and MY happiness to move and live in misery for anyone. And honestly.... for the first time in four years I felt a little sorry I married him. If we weren't married - he'd be free to go where ever he wanted. Work where ever he wanted. Live where ever he felt like it. Him "missing out" on this great opportunity will somehow end up being MY fault. Saturday was not any better. Thursday night I got no sleep dealing with Valerie. Friday I got no sleep due to Clint's snoring. Saturday morning, Valerie woke up before 7am. Clint eventually got up and completely ignored her cries to get out of bed. He was actually in the kitchen making himself a cup of coffee while Val yelled to get up. I was already exhausted from taking care of her all week by myself, add in me not getting much sleep.... I was not happy. I get up with her 7 mornings a week and many times Clint has slept in while I got up with her on weekends. There was no reason why he couldn't have gotten Val out of bed to give me a break - he was already up!! But no, he ignored her, and I had to do it (both Saturday AND Sunday.) This all led to a lengthy tearful discussion about how he shows no concern for me at all. Countless times he has just walked away and left me all alone when I needed him because he had "other" things to do. Even as I sited examples, his reply was "I had to finish my school work." But what about ME?? It would just be nice to be first for a change and have him show some type of concern, especically under the current circumstances. He has been too busy to show much interest in this pregnancy and my well being that I feel like I'm in it all alone. Way too many tears shed over the weekend. And nothing accomplished. I just looked at my PG countdown ticker on a message board I belong to. 60 days left 'till my due date. I'm sad in a way that my one-on-one time with Valerie is limited. I would give anything to have a few feel great days full of energy to do some fun mommy/daughter stuff with her before the baby is born. I don't see it happening. Sad, too, in a way that no longer will it be the three of us. My whole life I was part of a family of three. I don't know how to be a family of four!! But I am excited and I can't wait to meet my baby girl, Veronica. I can't wait to see what she looks like. I wonder if she'll resemble Valerie when she was a baby.... or if by chance this one will take after me!!! I am trying to see the light at the end of the tunnel... it's there, but just not very bright!! I am ready for this pregnancy to be over and done. Clint is in Houston all this week. *sigh* I'm completely drained and it's only Tuesday. My parents were supposed to stay over last night and help. Of course, they changed their minds at the last minute and went home leaving me by myself. It is just so hard keeping up with Valerie feeling like this. It's impossible to rest. I can't even give her a bath because there is no bending over the tub with this belly!! I'm just doing the best I can.... and trying to be thankful that this is Clint's last trip until after the baby!!! What happened to my baby who was such a good sleeper?!? Valerie has been staying up later and later, yet still waking at her normal *early* hour of 7am. Sometimes earlier than that.... I guess I took it for granted that she'd lay down and go to sleep on her own about 8:30ish every night. Not anymore!! But last night.... gosh, it was like she had two speeds..... FAST and FASTER!! She was bouncing around, singing, spinning, yelling, laughing... you name it. For hours. HOURS. We tried EVERYTHING to quiet her down. She did not go to sleep until 1:00am!! Yes... 1am in the morning!!!! It didn't help that at 11:30 she was laying quietly in our bed (after hours of bouncing and rolling around), when all of a sudden she sat up and *blech* vomited all over. Luckily I saw it coming and grabbed a towel... quick. We still had to strip the bed, put Val in the tub, and toss the messy laundry in the wash. After the bath, she was completely wired once again. AND today she was up bright and early at 8am, just as happy as can be. I don't know if she just needs less sleep now or what. I am going to start cutting her naps back during the day if this continues. I just can't deal with her staying up all night like this! I'm so exhausted today. We have so much to do around the house, and here I am useless because I feel so bad. Clint is leaving to spend another week Houston tomorrow, so I really wanted to take care of some things before he left. Please please let her sleep tonight!!!! I had a doctor's appointment this morning. Not much news to report. I got to take the "fun" one hour glucose tolerance test. Yuck. I did a lot of sitting around waiting to see my doctor and waiting for the hour to pass. Everything seems to be going just fine. I got my pre-admit packet and I have to go fill out the hospital paperwork next. Yikes, I really am going to have another baby?!? I go back to the doctor in two weeks. We have got to get busy in Veronica's room. I have just a little over 9 weeks to go, give or take. It seems like there is still so much to do in there. Mostly it's shifting toys to Valerie's room, sorting through things, and cleaning. I ordered Veronica's hanging wall letters a few days ago. I was going to buy and paint them myself, but I found someone on ebay that will paint and put hanging ribbons on them for $1.99 / letter + $6.00 shipping. I figured it's worth the few extra dollars to have someone else paint them!!! And maybe one day we'll get around to actually finishing Valerie's new room!!!!!! I've been having all kinds of braxton hicks contractions. I've noticed if I'm on my feet or moving around, they start. The past few days have been really busy, and I'm sure that's part of it. When I lay down, I might have a few more and it stops. I timed them yesterday for a bit yesterday and they were 10 minutes apart. I'm drinking more water thinking maybe I'm dehydrated and trying to stay off of my feet as much as I can. I remember having them with Valerie, but I'm not sure how far along I was when they started. They don't hurt so it's probably nothing, but some of them are more intense than I'd like at this point. 30 weeks is way too early. I keep telling Veronica to stay put for as long as she can! I go back to the doctor Wednesday, so I'll mention it. I'm not ready to spend any time in L & D just yet. A funny Valerie note... my computer is still in her room until we figure out where to move it. Clint came up with the idea of putting a picture screen saver on it. I put pics of her favorite things: butterflies, flowers, Big Bird, babies, animals, and some of us. She's been waking from her naps "talking" to the pictures. "Hi Big Bird! Hi!" And just babbling away to the pictures. It's pretty cute. At last.... After a month following the furniture ordeal, I have my living room just about back in order. And now the NEW stuff. I'm going to get a few burgandy throw pillows to add a little more color. I took Valerie to the doctor today. She hasn't been acting sick at all, but she can't seem to shake this cough and runny nose. It turns out she has some chest congestion and an ear infection. The urgent care doc said her breathing was just fine and her ears were clear, so I didn't know. I feel bad for not taking her to her pediatrician sooner. She wasn't acting sick though. Just last night she was a wild child. She was bouncing all over the bed and throwing herself down laughing. Then running and screaming loving the fireworks. She must have a high pain tolerance like her daddy! So now we have the right meds so she'll be well soon. I hope! I am STILL sick -- congested and just not feeling good. Clint got antibiotics for himself today. I have an O.B. appointment Thursday, so if I'm not well by then I guess I'll ask if there is something they can give me. I just want us all to be well! This sickness is just lingering on and on and on!